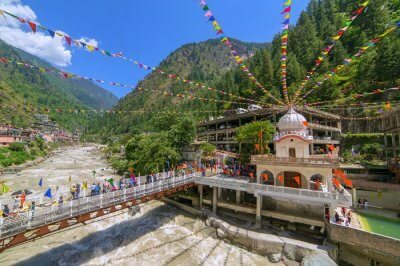 “Bizarre travel plans are dancing lessons from God.” So, when you go dancing on the winding roads of Tirthan Valley next, make sure you are accompanied by the finest accommodation options. 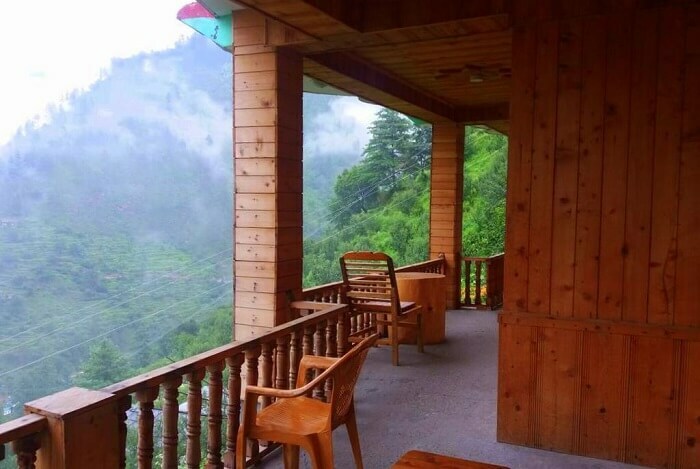 Besides the crystal clear water of the Tirthan River and the pleasant climate, what will refresh you is the decent number of well-maintained, comfortable, and elegant Tirthan Valley hotels and resorts there that are a soulful delight to a traveler’s heart. 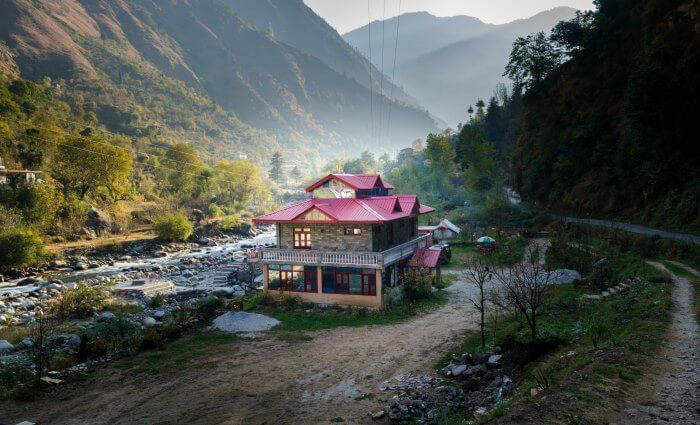 The accommodation options in Tirthan Valley ranging from resorts, hotels, guest houses, and homestays offer an unforgettable experience to travelers. Ideal for all – families, couples, and friends – Tirthan Valley hotels are set amidst charming forests, fragrant valleys, and splendid natural beauty. Trishla Resort adds to the flawless beauty of Tirthan Valley. This might be the closest property to the River Tirthan. 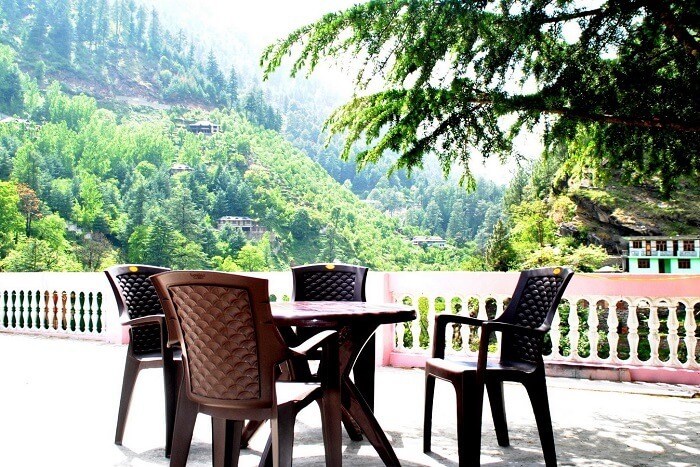 In the league of prominent resorts in Tirthan Valley Himachal Pradesh, Trishla Resort in Tirthan Valley is the one that has spacious gardens and a refreshing garden with colorful flowers where you can sit with your family, bask in the sun, and sip on tea. The staff of this resort is known to be very hospitable and friendly. 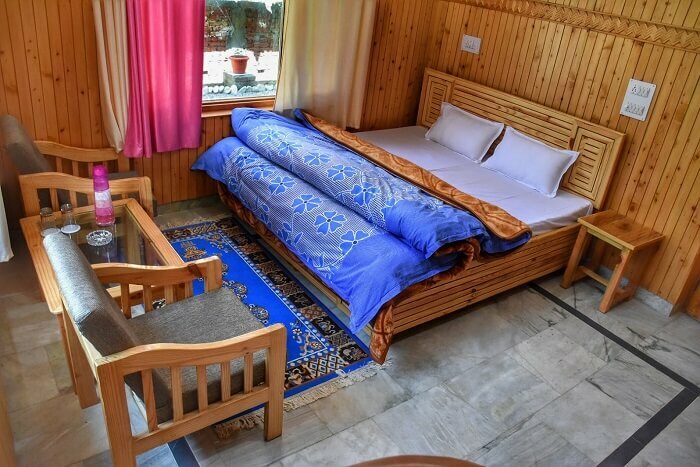 Situated in the ecozone of the Great Himalayan National Park, For A While is among the most comfortable hotels and resorts in Tirthan Valley. With a friendly staff and mouth watering delicacies, this hotel has the power to steal hearts. Once there, you would not want to leave. For A While is an unbeatably cozy retreat, perfect for a getaway from the hustle bustle of regular mundane life. 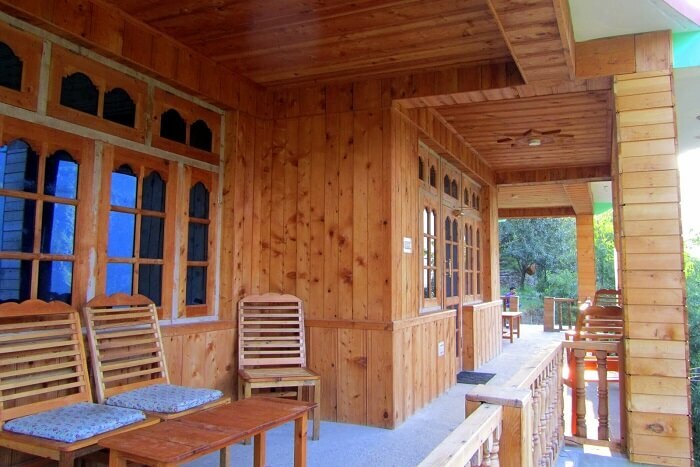 One of the most excellent places to stay in Tirthan Valley is JJ Resort. JJ Resort is a favorite spot of vacationers during winters. As the snow falls, everything around the place turns more serene and peaceful. They say that “there is no place like home”, Providing everything homely, JJ Resort fits in that definition pretty well! Beautiful interiors, cordial staff, quick room service, and serene surroundings are what you’ll experience here during your soulful getaway from the city life, which is why it is one of the most charming weekend getaways near Delhi. Suggested Read: Looking For A Holiday In The Secluded Heaven? Book A Trip To Tirthan Valley Right Away! Out of all the other Tirthan Valley resorts and hotels, Sharda Resort has the most obedient and enthusiastic staff which aims at satisfying their customers. Moreover, the location of the resort is such that it rejuvenates the souls of the travelers. Parking facilities and the charming view of the Tirthan River from the room windows will make your stay at Sharda Resort memorable. 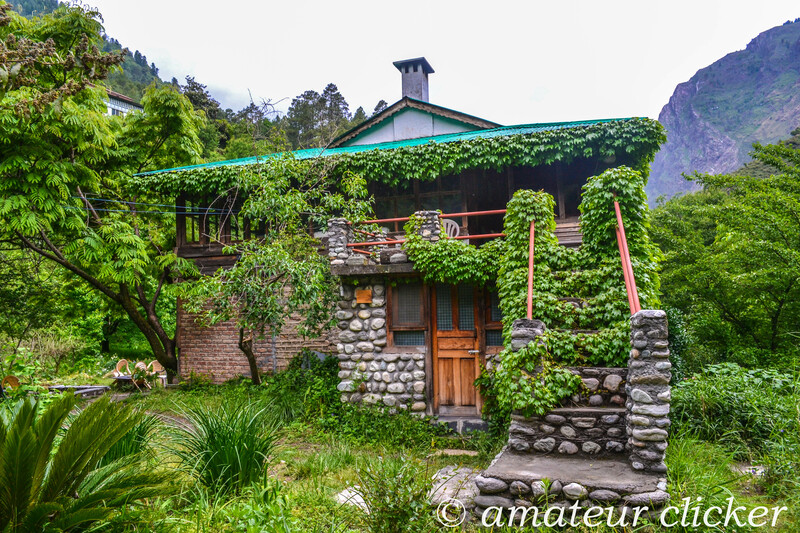 Another one among all the places to stay in Tirthan Valley is the Green Alpine Homestay. An absolutely unexpected stay in Green Alpine will make your trip what it should be. Set amidst a small stream by the riverside this place is ideal to spend some quality time with family and friends. Also, there is an elegant waterfall at a mere distance of 8 to 10 minutes from the hotel. As the name suggests, Nature’s Lap Resort takes you on an ultimate date with Nature. 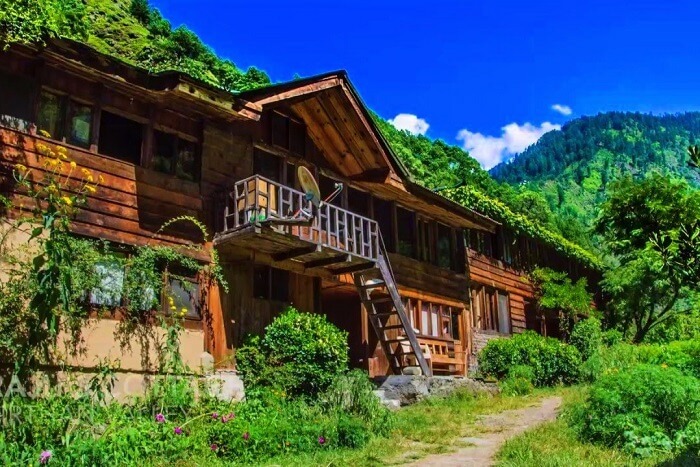 A perfect place to stay for the nature lovers, Nature’s Lap Resort is among the cottages in Tirthan Valley that offer impeccable amenities along with myriad activities for children. Amenities: Free high-speed internet, Conference facilities, Laundry service, Banquet room. Amazing balcony views, tastefully decorated rooms, fresh food, and adventurous activities are some of the perks of your stay in Whitestone Cottages. 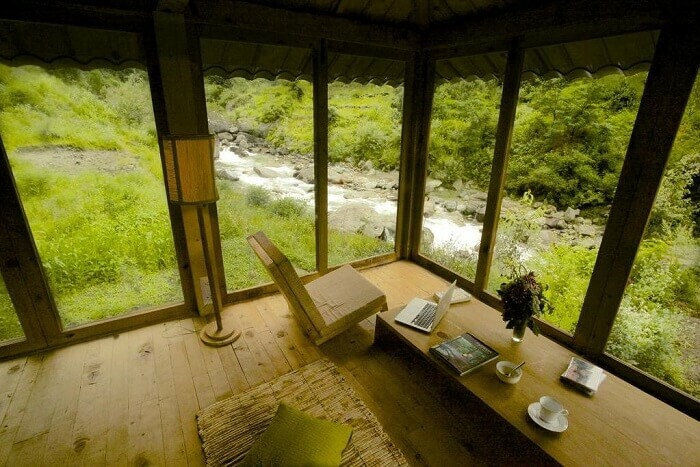 A gorgeous place with beautiful mountain views from the windows is everything one might need to kill his fatigue. A cup of coffee and your favorite book can be the prerequisites of a cozy evening here. 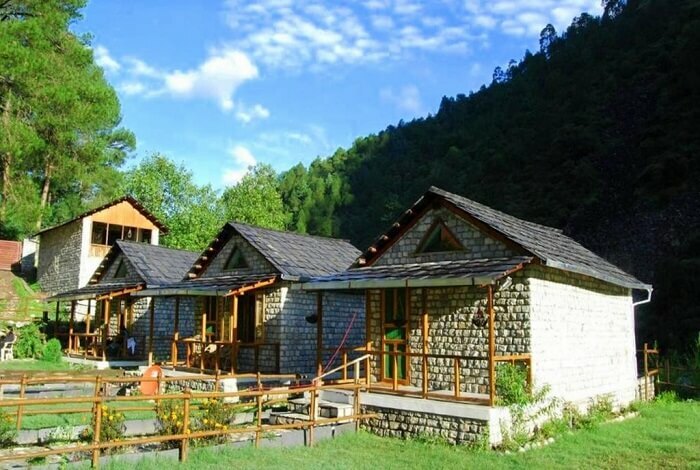 Whitestone Cottages is among the most famous Tirthan Valley hotels and resorts. Suggested Read: Top 15 Hill Stations Near Shimla That Are Perfect For A Himalayan Getaway! Witness simplicity at its peak with your stay at Devat Farm Cottages while on a trip to Tirthan Valley. 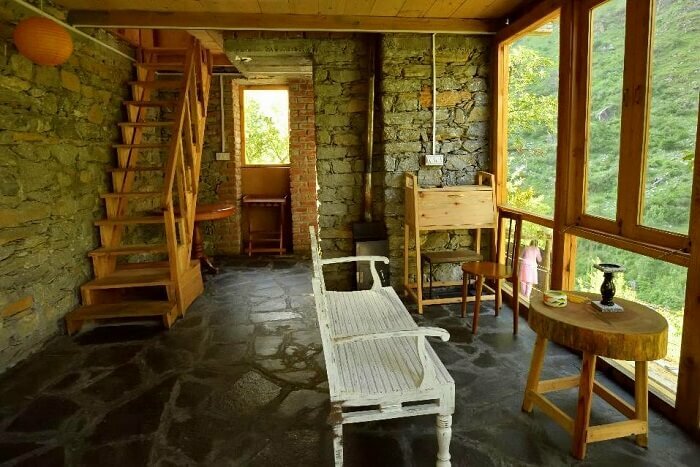 These picture-perfect and comfortable cottages are proof that Tirthan Valley is no less than mini heaven. 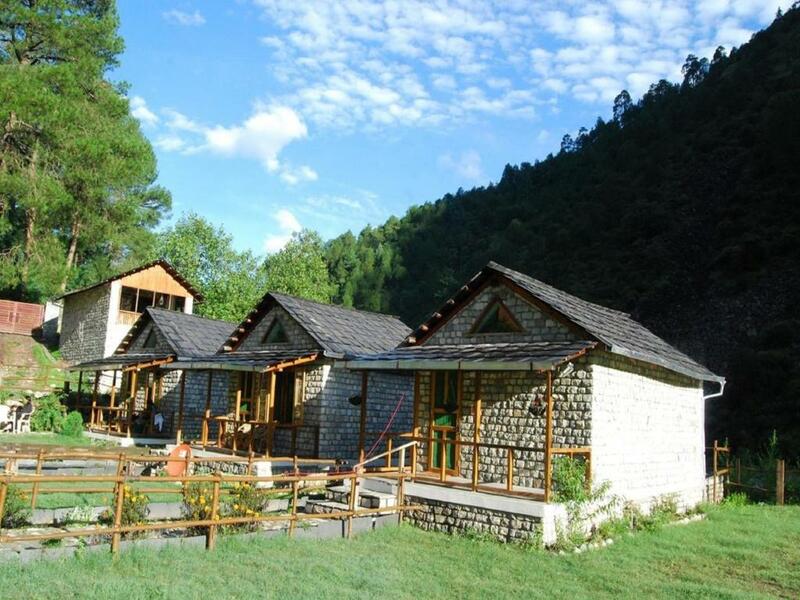 In the league of Tirthan Valley hotels and resorts, Devat Farm Cottages are the simplest ones. 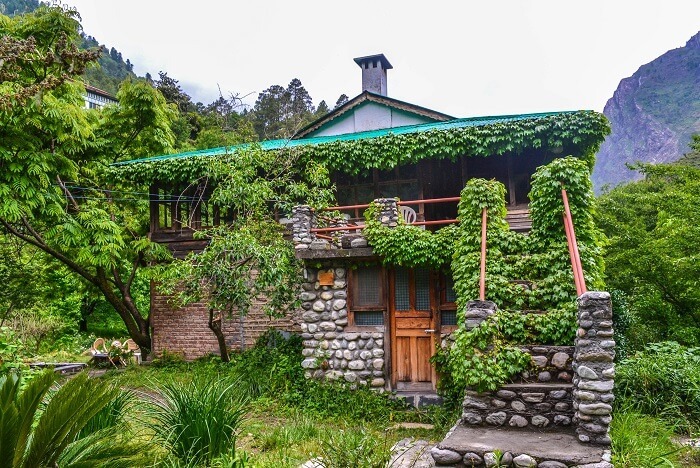 Basic interiors, good quality food, polite hosts, a serene river flowing alongside, and panoramic views of the magnificent mountains, all of these and more are offered here at Devat Farm Cottages at really economical rates. 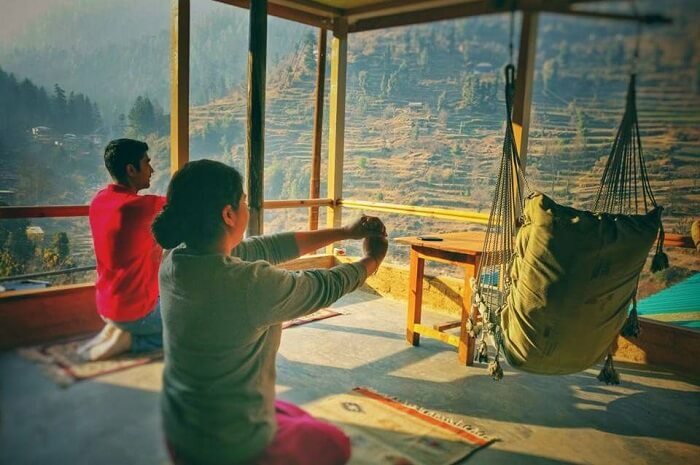 The Tirthan View Homestay is an exemplary place to find tranquility and peace. It’s yet another favorite accommodation for vacationers which is absolutely kid friendly and offers utterly delicious food. This hotel provides amenities like gorgeous mountain views. Tirthan View Homestay is an ideal retreat for those wishing to go on a smog-free weekend trip to Tirthan Valley. Pack your bags for a delightful stay right now! Latoda Hut & Pine Wood Home is among those Tirthan Valley hotels and resorts which turned famous overnight with least commercialization. Explore the unseen in Jibhi with your stay at Latoda Hut & Pine Wood Home. Friendly hosts, amazing food quality, serene atmosphere, comfortable and leisurely furnishings, and a gorgeous location – what else do you need on a trip to Tirthan? Everything about this place is designed to complement these most photogenic valleys in India! Leena’s Place is an ideal stay option for the nature lovers. Mountain views, the meandering river, and home like comfort, get all of this and more at one place – Leena’s Place. 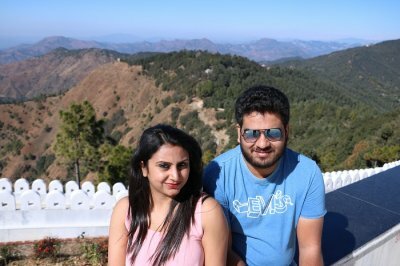 Besides enjoying the stunning beauty of Tirthan, tourists can enjoy the company of other travelers as well during their stay here. Awaiting you at Leena’s Place is good quality food that delights the taste buds and amazingly friendly staff, which is why it’s one of the best places to stay in Tirthan Valley. 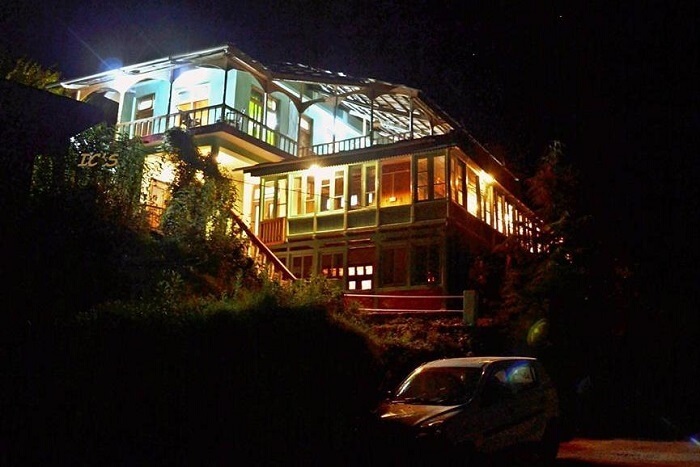 Another place in the list of best hotels in Tirthan Valley is Raju Bharti’s Guest House. Along with a pleasant stay experience, the guest house offers basic amenities and spectacular dining options. The food is no less than homemade meals. The presence of butterflies, cats, and dogs all around in the garden make it a paradise for nature and pet lovers. Come back to this aesthetically done homestay after hiking all day to relax. 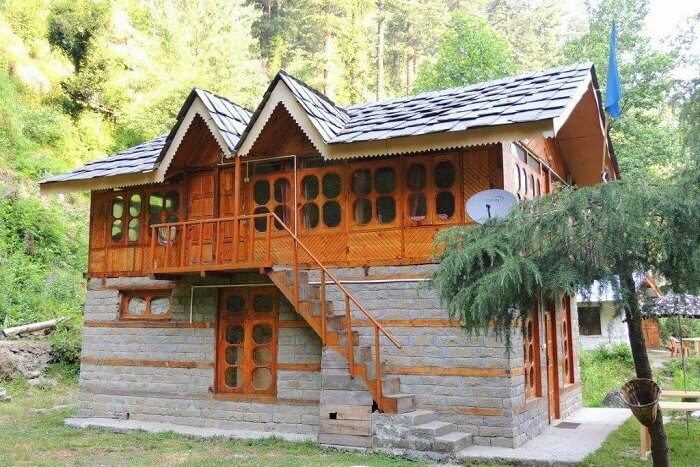 Tirth View Homestay is among other well known places to stay in Tirthan Valley. Views of the magnificent mountains and the extravagant waters of the Tirthan River add to the serenity of this cozy place. Tirth View Homestay is in the closest proximity of the river. Do consider staying here on your next trip to Tirthan Valley for a blissful holidaying experience! 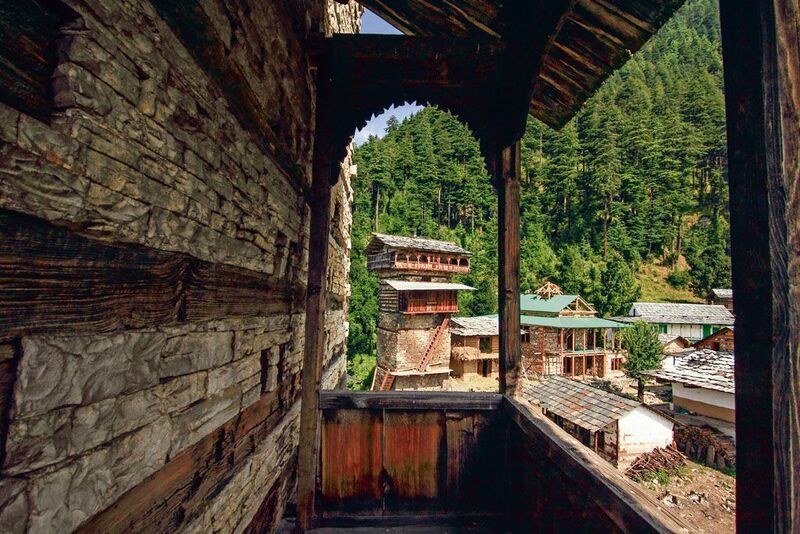 Must Read: Looking For A Holiday In The Secluded Heaven? Book A Trip To Tirthan Valley Right Away! 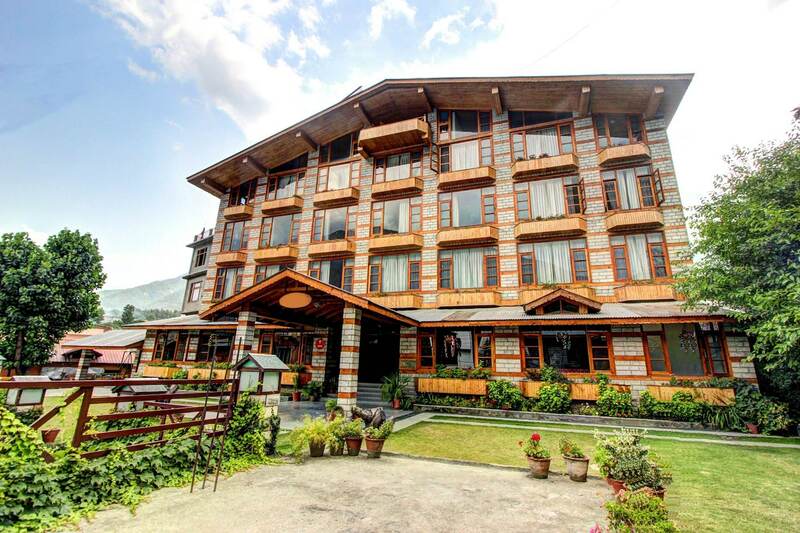 Like all the other Tirthan Valley hotels and resorts, Bhagwati Homestay offers comfortable accommodation, culinary delights prepared with love, stunning mountain views, decent hospitality, and clean rooms and bathrooms. 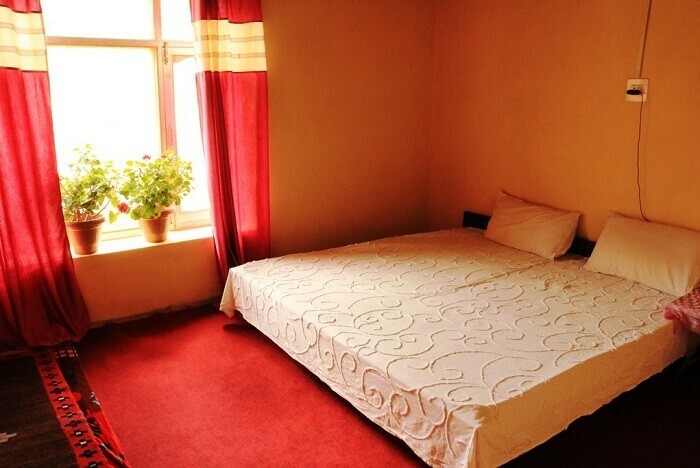 In addition to all these amenities, a stay at Bhagwati homestay is very much affordable. Though it may seem simple from the outside, it’s incredibly lovely on the inside. 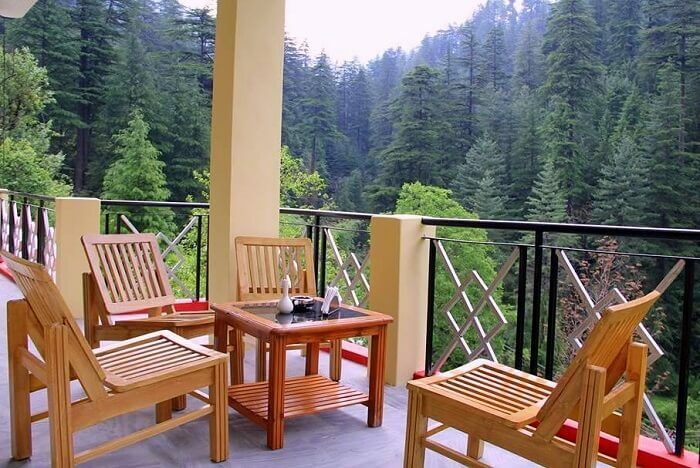 A stay at this place will make you fall in love with the hills of Himachal, all over again! As the name suggests, Sun N Sky is a flawless amalgamation of natural surroundings. Stay here while you explore the nearby Jalori Pass. Gorgeous mountain views and clean rooms are the facilities offered by Sun N Sky. Do visit this place to witness the furiously gushing Tirthan River at its best. Tirthan Valley hotels will make your stay a memorable affair. Staying in Dev Conifers Green means waking up to the refreshing sounds of the gushing water owing to the small river nearby. 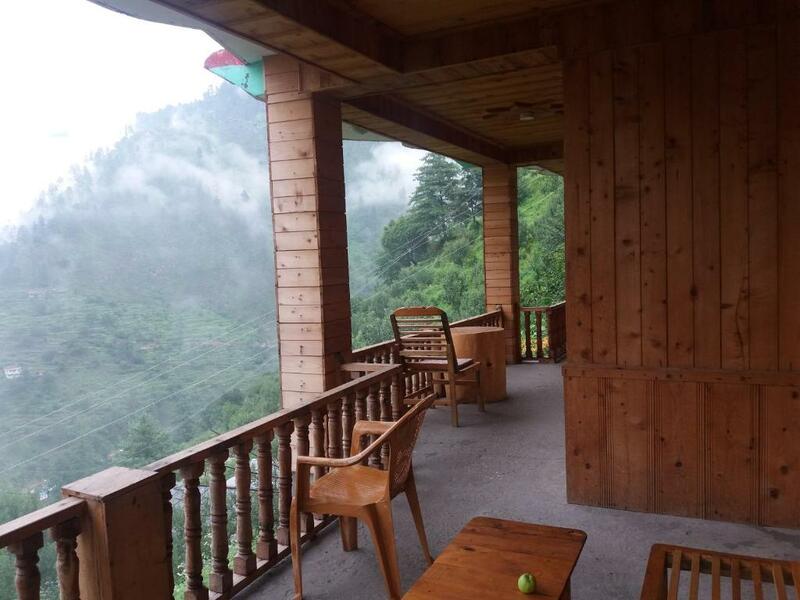 Among all the other Tirthan Valley hotels, Dev Conifer Green is a very elegant place which offers clean rooms, washrooms, and mesmerizing balcony views. Visit this place once, and we bet you’d want to visit again! 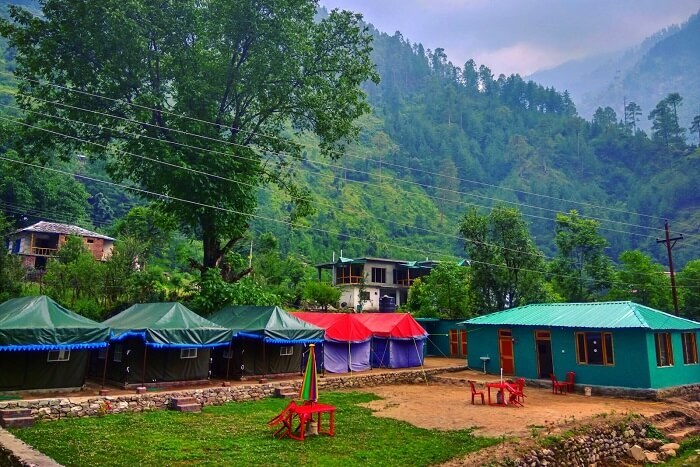 Tirthan Holidays Camp And Cottages is a phenomenal place to spend your week long vacation in Tirthan Valley to get the insights of nature. Tirthan valley is already a paradise for the nature buffs and this place adds to the serenity of the destination with the glorious mountain views. Get ready for a memorable and mesmerizing trip when here! From indulging in adventure activities in the day to sitting peacefully next to the bonfire all evening and night, Hotel Trout Valley gives you the most memorable holiday ever. 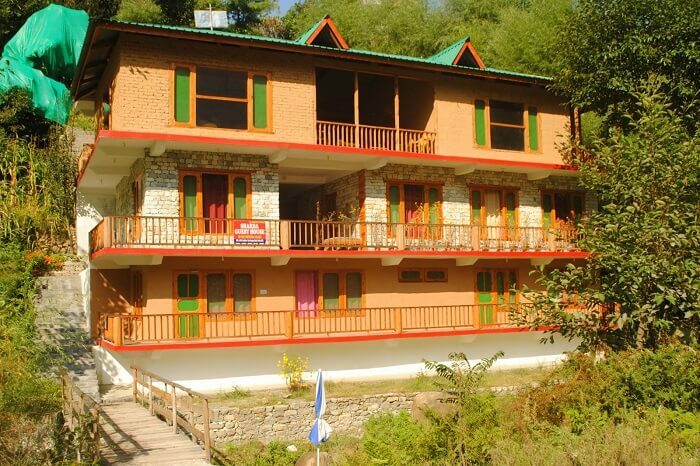 Hotel Trout Valley is one of the most prominent places to stay in Tirthan Valley. Make your own snowman at a mere one hour drive to higher peaks and get your feet on one of the most exciting treks alongside a stunning waterfall. 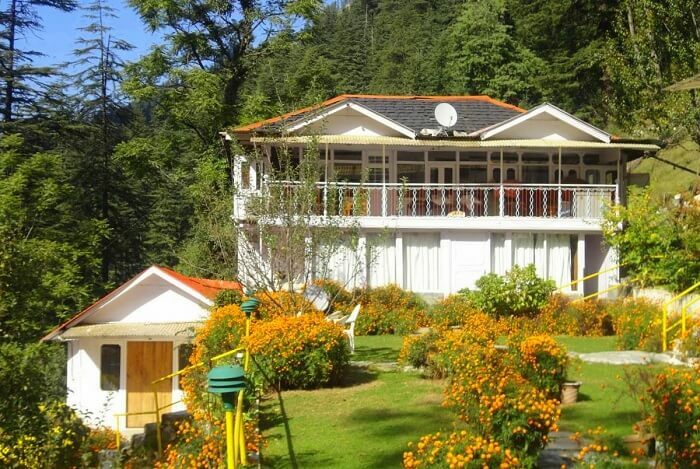 Among the most extraordinary Tirthan Valley Hotels, is Hotel Cedar View! This hotel is beautifully built to cater to all the basic amenities of trippers. All the rooms are clean with facilities like basic toiletries, attached balcony, and hot and cold running water all the time. The hotel also offers outdoor activities like volleyball and jungle treks. 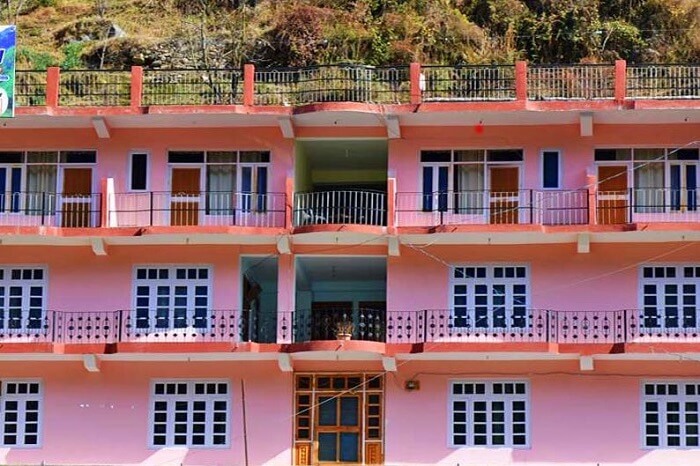 Vacationers who want to experience the best of hospitality and beautiful views of lush green mountains, Crystal Mountain Homestay is among the best hotels in Tirthan Valley. Facilities like swimming, hiking, and fishing attract numerous travelers throughout the year to stay in this beautifully designed homestay. Moreover, Crystal Mountain Homestay allows pets and charges nothing extra. Is it advisable to visit Tirthan Valley in winters? A. Travelers looking forward to enjoy their vacation in snow and who can handle the freezing cold should visit Tirthan Valley in winters. 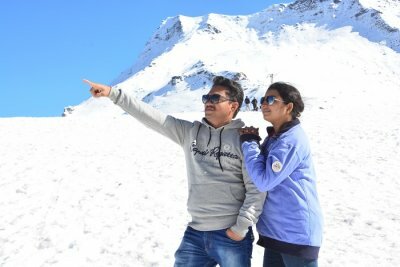 However, the time period between March and June is considered to be the best time to visit this place when Tirthan Valley temperature is quite bearable and the weather is at its most pleasant and one can indulge in a variety of things to do in Tirthan Valley like adventure activities and sightseeing. A. Tirthan Valley is well connected to other parts of the country by all means of transport. By Air: The nearest airport to Tirthan Valley is in Bhuntar near Manali, Kullu. By Road: There are numerous possible routes to reach Tirthan Valley by road since the hill town is connected to all nearby cities like Delhi, Chandigarh, Manali, Jaipur, and more, with a well-maintained road network. Whether you are traveling by your own vehicle, or the private AC buses (sleeper, semi sleeper, and more) being operated under many tour agents, the scenic routes and the winding roads are sure to give you a fun road trip to Tirthan Valley! By Train: The Ambala Cantonment Junction railway station in Ambala and the Kiratpur Sahib train station in Kiratpur are the nearest railway stations to the valley. Once here, one can easily either hire a cab or board a bus to reach the Tirthan Valley from the respective railway stations. 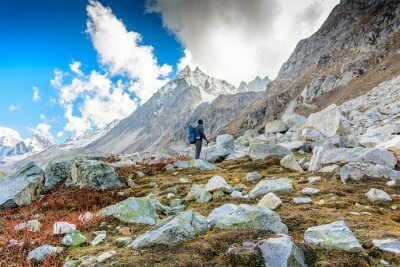 What are the best places to visit near Tirthan Valley? A. Being one of the most desired tourist destinations, Tirthan Valley is surrounded by many attractions in its close proximity. Some of them include the Great Himalayan National Park, Jalori Pass, and Serloskar Lake. 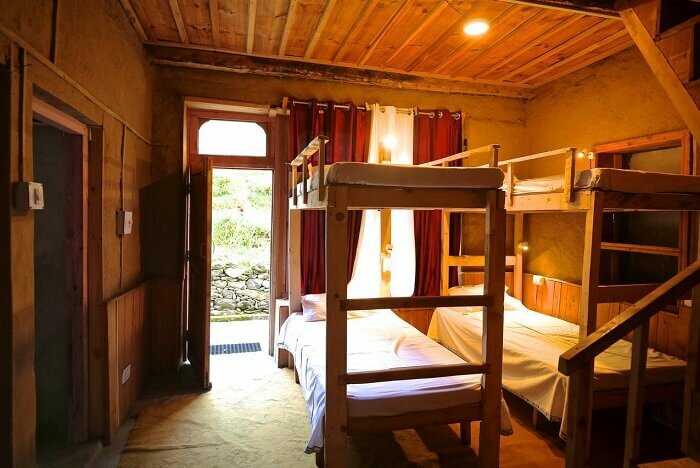 Planning a visit to Tirthan Valley but don’t know where to stay? 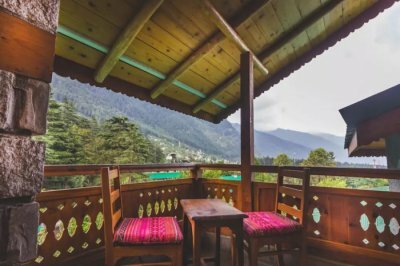 The above-mentioned Tirthan Valley hotels and resorts are the perfect abodes designed to meet all your travel expectations – adventure, comfort, luxury, yet all on a budget! 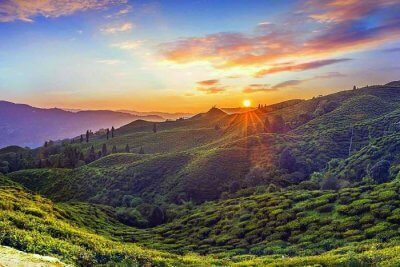 And don’t settle down with just one since you can never have enough of the beautiful Tirthan Valley. The land of serenity is calling you! So hurry up and start planning your Himachal vacay now!